Momofuku Milk Bar Bagel Bombs are based on the book’s “Mother Dough” recipe, which is simply flour, salt, active dry yeast, and water, kneaded in a stand mixer and proofed for 45 minutes. The first time I tried to make a 1/2 recipe, because that was all that was required for the Bagel Bombs, but the dough ended up being too wet. I remade the dough using the full recipe and it came out appropriately. The Bagel Bombs contain a surprise inside, a plug of cream cheese, bacon, and scallions. These are frozen and then wrapped in the dough. An egg wash is applied, followed with a sprinkling of Everything Mix (garlic powder, onion powder, dried onions, salt, sesame seeds, and poppy seeds). Then into the oven, although at the recommended temp of 325 mine didn’t brown. For my second batch I used 350; your oven temp/time may vary. As you can see, some of the cream cheese explodes out of the bagel, but Christina Tosi says that is to be expected. Fresh out of the oven, these Bagel Bombs are delicious. The Everything Mix on top is nicely balanced, the dough is reminiscent of a bagel, and how could you go wrong with a warm, gooey center of bacon-scallion cream cheese? Hmmm…I used all purpose flour and it worked well for me. I also used a kitchen scale to weigh out all the ingredients. Good luck and thanks for reading! I must confess, I used the Benton’s Bacon solely as a prop for the picture and used regular bacon for the actual recipe. I need to come up with a really special dish to try out the Benton’s. Thanks for bringing it back! 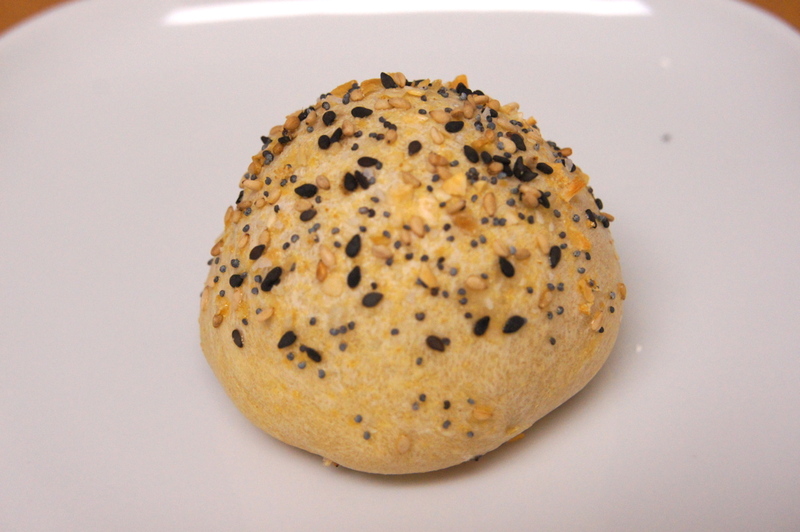 Hi there, I’m planning on making bagel bombs tomorrow, but I’m a little bit confused about the mother dough recipe, so maybe you can clarify since you’ve made them. Are you supposed to use instant active dry yeast or regular active dry yeast for the dough? On the one hand, the regular stuff doesn’t usually break down unless you dissolve it in liquid first, but the recipe doesn’t specify that. On the other, the book says “active dry yeast” in its ingredients section, which usually indicates the regular stuff. Thanks. I used the regular active dry yeast from the supermarket. The dough didn’t rise that much, so maybe instant yeast is a good idea. Good luck! Thanks, I’ll let you know how it goes! The instant yeast worked really well. Given the amount of flour and the short period allowed for fermentation, too, I’m pretty sure that instant yeast was the intended way to go. I had the same trouble as you with the colour of my bagel bombs at 325. I’ll try 350 next time. I like the surprise inside 🙂 Cool recipe! I made these! They were so yummy!